Looking for a waterfront home in Key West with resort amenities and low maintenance? Key West By The Sea just might be the paradise home for you. Key West By The Sea is located directly across from beautiful Smathers Beach, the longest stretch of beachfront in Key West. At 2601 South Roosevelt Boulevard, you will find a securely gated community of 8 tropical acres. The condominiums are divided among three strong concrete buildings laid out so that each unit has full or partial Atlantic Ocean views. 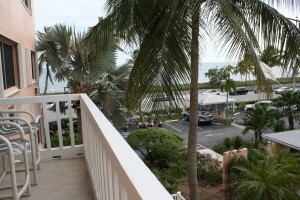 With the Atlantic Ocean on one side and the protected Salt Pond wetlands on the other, the views from Key West By The Sea Condos are only part of the experience. Two large swimming pools (one heated), two tennis courts, shuffleboard courts, community clubhouse and outdoor entertaining areas add to the resort like feel. Key West By The Sea is directly across from Key West’s famous Smathers Beach, popular with sunbathers and watersports enthusiasts. This is a main promenade with a wide paved sidewalk perfect for biking, rollerblading, running or walking. Two of the buildings (A and B, closest to the ocean) at Key West By The Sea have six stories and the “C” building has three stories all with elevator access and parking. 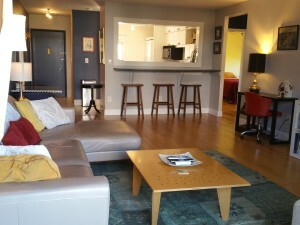 The units are either 1 bedroom/1 bath (750 sq. 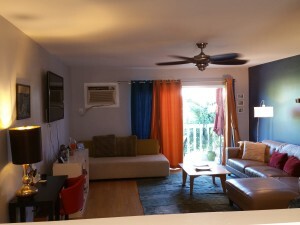 ft.), 2 bedroom/1 bath (980 sq. 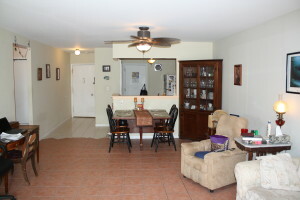 ft.) and 3 bedroom/2 bath (1220 sq. ft.) each with a private balcony. 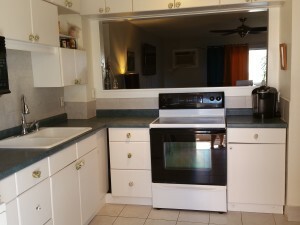 Key West By The Sea has a professionally managed condominium association with fees around $528 per month in 2015. The fees include Cable television , Exterminating, Trash Removal, Building Exterior Maintenance, Building Insurance, Common Area Maintenance, Pool Maintenance and on-site Management. Pets are allowed with restrictions and there are laundry facilities on-site, though most unites have a washer/dryer hook-up. Currently owners may rent the units, but only after one-year of ownership and the rental must be over 90 days. This gives the community some stability and feels more like a residence and less like a hotel. 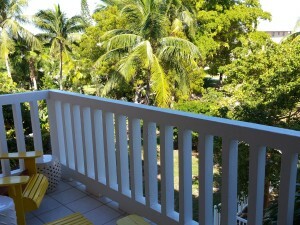 Unit 306B is 2 bedroom/1 bath has breathtaking Atlantic Ocean views. It’s on the third floor of the “B” building and has a recently updated kitchen. It’s listed at $449,000. THIS CONDO IS NOW UNDER CONTRACT. Open floor plan living and dining area. 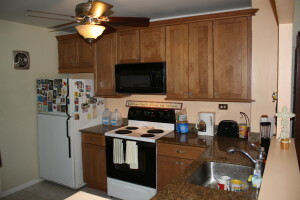 Updated kitchen with new cabinets and granite countertops. View from the deck of the pool area. Ocean view from the deck. Unit 311A is a spacious 3 bedroom/2 bath with hardwood floors and a great corner location, allowing for more windows and tons of natural light. Some waterfront views and Salt Pond views as well.It’s listed for $499,000. THIS CONDO HAS BEEN SOLD. Living area looking towards kitchen. Deck looking out to gardens. 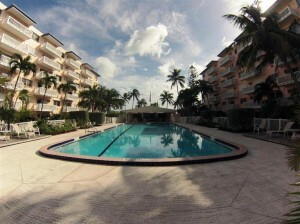 Click Here for a current list of Key West By The Sea condos For Sale. 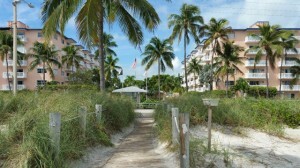 Think a Key West Condo is right for you, but not sure which one? 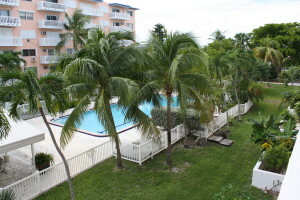 Read our Key West Condo blog for more information. Put us to work for you. We’d be happy to set up a personalized Search directly to your email. 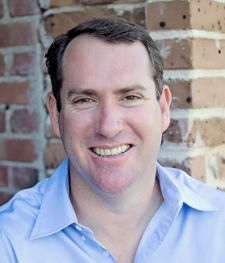 Call Sean at 305-924-0700 or email KeyWestRealEstateGuy@Gmail.com.